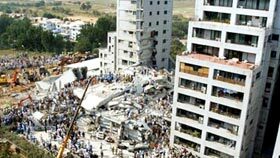 On the morning of October 8, 2005, Kashmir, Northern Areas, parts of NWFP (a Pakistani province) and federal capital Islamabad underwent catastrophic earthquake that resulted into a vast destruction both of human life and infrastructure like cities, business centers, educational institutions, hospitals, communication system etc. Beautiful residential houses, lush-green valleys and tall buildings were reduced to heap of debris in no time. Hundreds of thousands of children, women and men became disabled for the whole of their life. Thousands of married women became widows within twinkling of an eye and many old people were left shelter-less and helpless. The number of those who got displaced cannot be counted with fast approaching winter staring them in the face. Many people lost their sense of mental balance at this gigantic destruction. According to eye-witnesses, not only did the buildings stand razed to the ground but many villages also got dumped into the earth. Those who were fortunately saved from this tragedy had many misfortunes to mourn over like destruction of houses and businesses, deaths of relatives, friends and near and dear ones. Many mountains of grief, pain and worries stood like a rock before them. How difficult was to reconstruct a house in this age of dearness? Who would take care of the orphan and the helpless children? Who will look after the crippled and the disabled? Who will provide for the widows? This all-embracing destruction impacted adversely upon the people both economically and socially. 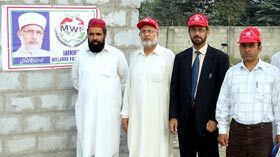 Minhaj Welfare Foundation (MWF) took timely steps for rescue of those still buried under the debris, provision of necessary items of foods and clothing, rehabilitation of affected people, construction of houses and schools by allocating millions of rupees. These projects are still underway. After this cataclysmic earthquake, Minhaj Welfare Foundation established 15 tent settlements in areas of Muzzafarabad, Bala Koat, Batgram, Valley of Neelum etc. More or less 1500 people were fed in these settlements for six months where facilities like temporary housing, food, clothing, iron sheets, medicines, free medical service and free ambulance service have been provided. In addition to that, millions of rupees were distributed in the form of cash. More than 2.5 million rupees have been spent so far. 600 Shelter Homes were also established. Besides this, the construction of schools and mosques has been started that is estimated to be around 25,50,00,000 million rupees. More Tent Villages Were Setup Establishment of Schools and Islamic Centers in Earthquake Affected Areas.